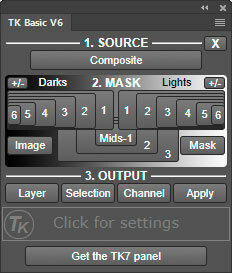 Get the TK Basic V6 panel-- Contains both the CC and CS6 versions of the TK Basic V6 panel for making luminosity masks in Photoshop. Also includes instructions for use, best practices for color management, illustrated installation guide, and video tutorials by Sean Bagshaw. The TK Basic V6 panel provides an easy way for photographers to start using luminosity masks. It's free when signing up for my (infrequent) email updates, installs in Photoshop CS6 and all versions of Photoshop CC, works on Mac and Windows computers, and employs advanced Photoshop calculations to make 16-bit masks. It has many useful and unique features. Rapid Mask engine. The Basic V6 panel uses the same core process for generating masks as the V6 RapidMask2 module. New masks are calculated and displayed on screen at near real-time speeds. Mask-based interface. Users see masks up front to make intelligent choices about which one to use. Intuitive layout. Top-to-bottom workflow with numbered sections for creating and deploying masks. Click-tracking. The last button clicked retains an accent-colored shadow. Users always know which mask they last generated. Multiple output options. Curves, Levels, Brightness/Contrast and Hue/Sat adjustment layers are available in the "Layer" menu. Selection, Channel, and Apply buttons provide additional output options. Compact design. Small footprint so image area is not obscured. The module can also be conveniently tucked up above any standard Photoshop panel. Instant help. Moving the mouse over any button provides information on what it does in the window at the bottom of the panel. Active selection indicator. Provides visual feedback that Photoshop has an active selection even if it's too weak to generate selection borders or if the marching ants have been turned off. Language switch. Settings dialog offers six language options for the panel's user interface. The TK Basic V6 panel is essentially RapidMask2-lite. It has the same core process and speed, and similar layout and features as its big brother. There are many ways to use luminosity masks when developing images in Photoshop. Adding them as layer masks on adjustment layers and painting through active luminosity selections are the two most common techniques. The Basic V6 panel makes it easy to add these methods to the Photoshop workflow. It's a great way to not only learn what luminosity masks can do for an image, and also to see how easy it is to use them as the Rapid Mask engine does all the hard work in the background. Luminosity masks need to be fast and intuitive in order to become a standard part of a creative workflow. The TK Basic V6 panel makes this possible and is the ideal tool for quickly getting up to speed with these techniques. Read more about the TK Basic V6 panel by downloading the Instructions PDF. Sean Bagshaw also recorded a fantastic video series that explains everything about the panel and how to use. You can watch three of them below. The full set is included in the download folder. Please feel free to contact me if you have problems, questions, or suggestions. Also, please consider connecting with me on one of your social networks or subscribing to my blog using the links in the upper right. New information about luminosity masks is regularly provided from these locations. × Please review the End-User License Agreement and click the checkbox if you agree to its terms.